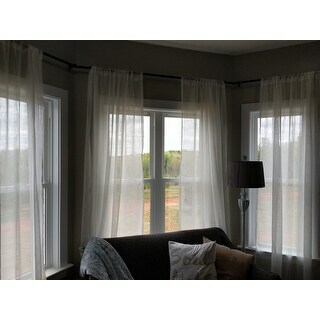 Belgian sheer panels offer a Belgian textured linen look and are designed to bring a light, airy feel to any room. The lightweight construction allows soft light in for a glowing effect, while keeping heavy sun glares out. The Belgian panels are constructed with a sewn in rod pocket and can be hung on your favorite curtain rod, adding yet another touch to the finished look of your window decor. These window curtain panels will drape beautifully from any window that could use that perfect, finishing touch. Our curtain panels are perfect for any living room, bedroom, family room, dining room, bathroom and office. Our stylish designs will suit any window space. Dimensions 63.0 In. X 50.0 In. X 0.2 In. I love the fabric. It is as luxurious as real silk. The sewing in the rod panels is solid. Great curtains. I love these drapes! I still can hardly believe that they sell something this nice for this price. The material is not cheap and shiny looking.They hang in a soft gauzy way with a look of linen. I was looking for a drape to give my room a soft breezy look for summer. I hung mine with rings which gave them a loose, carefree look. I used 7 rings/panel which gave a nice drapy look on top. These are perfect if you are mainly wanting to only decorate your windows. They are sheer, so if you were needing them for a bit of coverage or privacy, I would probably not choose these unless you wanted to buy additional pairs to cover your window. I love that the color is not stark white. It is just a bit off white with no yellow. I have grey walls with white trim and warm toned furniture, making it the perfect color. I really like these panels and they are what I was looking for but the color looks more beige than grey. We even put them against our other grey curtains and they still look beige. We will have to use them in a different area than we intended because of the color. 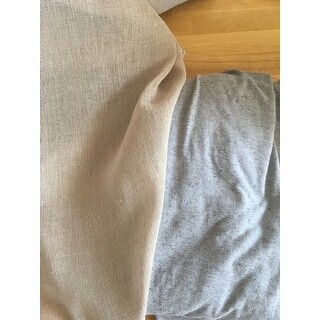 The size is true to size, the fabric is as stated, the label reads grey but they are beige. If the color had been what I expected they would have gotten 5 stars. 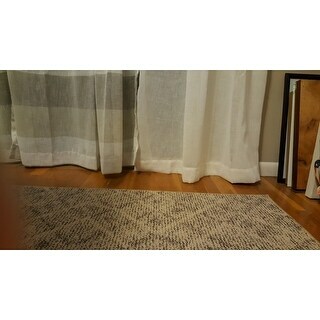 This picture shows the curtain on the left and the grey T-shirt on the right. Love the look of these window panels - not your mother's sheers. Gauze look is perfect for an updated version of an old treatment. Would look great in any room. Have mine in living room. Light filter can be increased with multiple panels. Customize to your taste and need. I ordered these in the "snowflake" color and it's a clean soft white. I'd say it color matches Benjamin Moore paint chantilly lace or cotton ball. I hesitated to purchased because of the review that stated they weren't white, but they are just the right white for me! After checking the color I ordered three more pairs. What a bargain! love these panels, perfect for my dining room. Bought these to go with their home bern panels. The panels i got were longer than 84 inches. And 1 of the panels in the set was actually longer than the other. I still really like the way they look. The length is just irritating the ocd in me. I would buy them again. 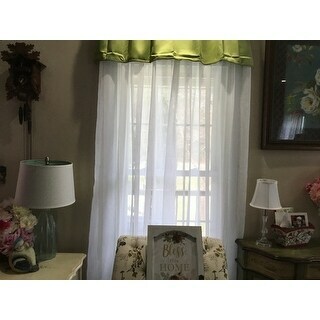 I purchased the snowflake color in both the 63” and 84” for bedroom windows along with curtain rods from Overstock. They were packed well on a hanger to minimize wrinkles. I just put them in the dryer on low with a clean damp hand towel for 15 minutes. I put them up and they hung beautifully. I have blinds on the windows and this softens the room nicely. 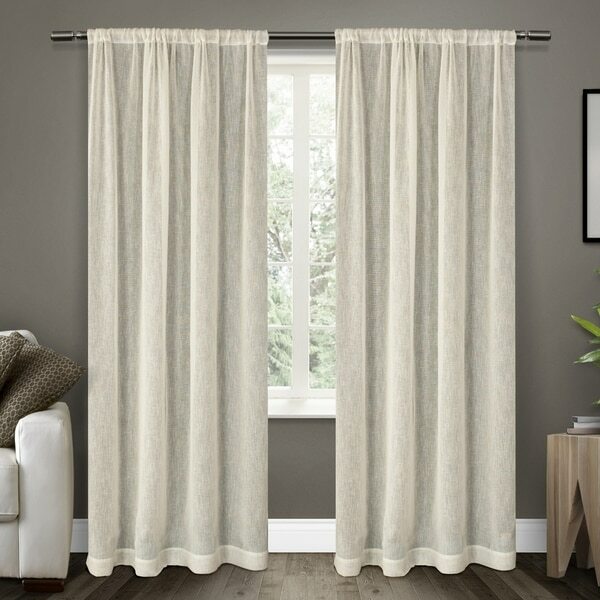 These curtains are a fantastic buy compared to others I researched. These panels are the perfect addition to the drapes I've used them with. They're not anything like any other panels I've ever purchased. Adore the texture and lighting allowed. The curtains are substantial, more than a sheer, but textured linen gives a rich casual feel. This is an EXCEPTIONAL buy. I was looking for something light and airy at an affordable price. These curtains are great! They are a perfect neutral shade which goes with my decor and add a lot to the room, without jumping out at you. I would definitely purchase these again. These curtains look great in our living room. The linen gauze-y look of them gives them a lot more texture than a plain set of sheers. They do let quite a lot of light in, which we don't mind. They arrived and sort of had a weird smell, but nothing a quick rinse off in the washing machine on a gentle cycle couldn't fix. The wrinkles were kind of a hassle to get out, but a steamer does the trick. We were worried about being able to see through them from the outside at night, but they are not too bad. The snowflake color is a great off white, but still more white than ivory. They are very easy to match. Beautiful and sheer! Lets in lots of natural light. It is very sheer but gives enough coverage to block unwanted lights at night. We love them! It adds some cottage charm to it!! 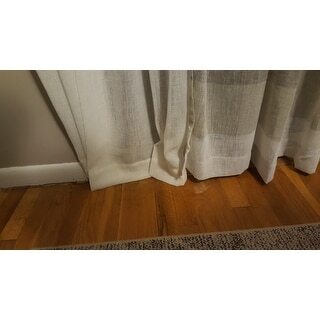 I did not love these curtains... they were very thin, not great quality. I adore the way these drape. Beautiful flowing light-diffusing softness. Perfect for spring breezes, balmy summer days! No runs, same length. No issues I can find. Love them! I love the curtains, but will not be putting them up for a few week’s! I will send a photo later! They are snow white. Not soft white or even cream, as they looked to me in the photo, next to the white couch. Their length is perfect, the material is pretty and they are nicely made. I am disappointed, but I am thinking of dying them to soften the color. These are natural linen-type light-diffusing curtains. They are very pretty and well-made. Just what I was looking for. I like that they don't block out all the light and look like fabric curtains but they do hold onto wrinkles like a bad grudge. Our back family room is kind of our dark cozy room. The walls are a dark color and so were the original curtains. It was getting to be too claustrophobic. These curtains are perfect because they give you that cozy feeling but they're a little lighter colored so you don't feel like you're in a cave. They keep the light from outside down if you want it darker. The color and quality are just as expected. They have a beautiful fullness and hang very nicely. "Do both panels total 50” or is it 50” per panel?" "when the stone color will be available? I need two additional sets. " We do not expect to get this back in stock. "I am looking for carpet stair treads. A couple of years ago I purchased them from overstock. I do not see them in my search. Are they still available?" "What is the rod pocket size? What rod diameters will work?" This has a 2 inch rod pocket, allowing for a rod of the same. "What is the material of this curtain? Is it linen or polyester?" This is constructed of polyester, with a linen look. These curtains are sheer and not very private. "I am looking for a white curtain. Winter white is not offered in the length I need. Is snowflake white or off white? Does it have yellowy undertones to it?" I bought the Grey and the Stone. I love these curtains. I would try the snowflake to see if they are white enough for your decor and usage. But the quality to my mind allows for any adjustment because these are lovely.